Basil Bunting (1900-1985) is best known for his long poem 'Briggflatts' which has come to be recognised as one of the key texts of British modernism. 'Briggflatts' was the culmination of a lifelong dedication to poetry which began in Bunting's childhood He was born into a Quaker family in Scotswood-on-Tyne, Northumberland, a region with a rich oral tradition of ballads and folk songs which were amongst Bunting's earliest encounters with language. He was educated at two Quaker schools, in Yorkshire and Berkshire. Brought up in the movement's tradition of pacifism he was imprisoned for six months as a Conscientious Objector in the First World War. After his release Bunting began a series of wanderings that took him from London, to France, Italy, the Canaries, Persia and the United States, before settling back in his native landscape. Both rooted and nomadic, Bunting's life enacted one of the central concerns of his work: the necessity of leaving home and the desire to return there. 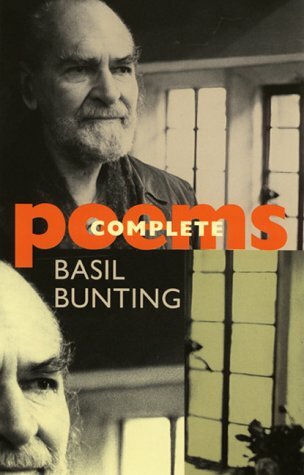 Bunting's literary life began in post-war London but the most significant event of this early period was his meeting with Ezra Pound in Paris in 1923. The two became close and Pound acted as a mentor to Bunting, introducing him to fellow progressives, in particular Louis Zukofsky, influencing his poetic ideas and publishing over fifty pages of Bunting's poetry in his 1933 Activist Anthology. Bunting followed Pound to Rapallo, Italy, but returned to England in 1925 on the death of his father. For several years Bunting made his living in London as a music journalist before returning to Italy to work for Pound. In 1929 Bunting married Marian Culver and the following year his first pamphlet was published privately in Milan. It received one review, from Zukofsky, and then disappeared. Despite being ignored by the literary world, Bunting never wavered in his commitment to his writing, developing an inner conviction as to its worth that kept him persevering through personal and financial difficulties. These included divorce in 1940 from his first wife with whom he had had three children. Back in Britain as the Second World War broke out, Bunting enlisted in the RAF and was stationed in Persia as a translator (he knew classical Persian). 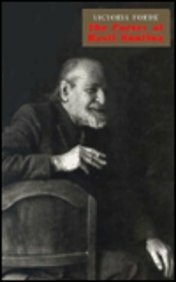 He grew to love the country, remaining in the British Embassy in Teheran after the war and marrying a Persian, Sima Alladadian, in 1948. In 1950 Bunting's first full-length collection was finally published - in Texas - an indication of his cosmopolitan connections. Bunting might have stayed permanently in Persia but in 1952 was expelled by Mossadeq which prompted a return to his native Northumberland. The 1950s were a lean decade as Bunting eked out a living as a journalist and wrote little. However, by the 1960s a younger generation of poets had begun to seek him out, one of whom, Tom Pickard, was instrumental in encouraging Bunting to write again. In 1965, at the traditional age of retirement, Bunting saw his first major British publications: The Spoils, First Book of Odes, and Loquitur. This revival in interest culminated in the publication of Briggflats in 1966 which finally secured Bunting's reputation: he was awarded an Arts Council Bursary followed by the Northern Arts Poetry Fellowship. 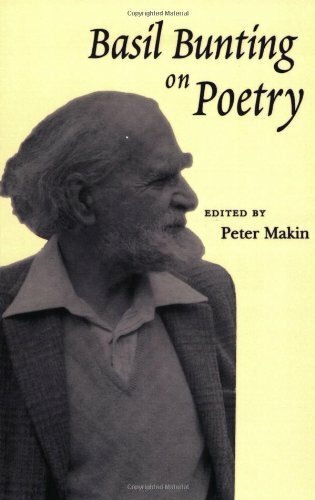 In 1978 the first edition of his Collected Poems appeared. Bunting died seven years later in Hexham. "A struggler in the wilderness" for most of his writing life, Bunting is now cherished for his innovative blend of influences: his poems draw on a poetic tradition that stretches back through Wordsworth and Wyatt to Beowulf, but were also influenced by the techniques of high modernism and his experience of other cultures. This blend is seen vividly in 'Briggflatts', his masterpiece of home-coming. Named after a Quaker meeting house in Cumbria Bunting visited as a schoolboy, the poem is dedicated to Peggy Greenbank, the sister of a school-friend whom Bunting developed a strong attachment to. The poem tells, highly obliquely, the story of this lost early love and of Bunting's Odysseus-like wanderings. 'Briggflatts' embodies Bunting's belief that "poetry is sound" with its symphonic five-part structure and complex patterning of rhythm, rhyme and motif. A vigorous editor of his own work (the original draft was over 2,000 lines) there is nothing arbitrary about the free-verse of 'Briggflatts', each part being meticulously composed. 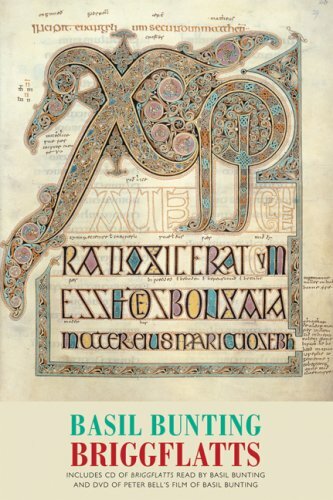 Bunting's emphasis on musicality also informs his reading style - grand, but not affected, he enunciates each word clearly, his rolled 'r's typical of the local accent he grew up with. 'What the Chairman Told Tom' and ‘On the Flyleaf of Pound’s Cantos’ show his more light-hearted side. The first, spoken in the pompous tones of a self-made man, is funny but also has a personal bite - Bunting knew only too well the pressure to "go and find work". His tribute to Pound is both warm and wry – famously describing the Cantos as the 'Alps' of poetry, it's as if Bunting was aware that his own huge achievement in 'Briggflatts' might be seen as similarly daunting to some readers. For any serious reader of contemporary poetry, though, its heights also need to be scaled - and the rewards are similarly exhilarating.